15 years of apologies won't prevent another data breach. 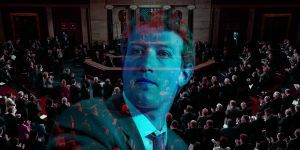 When Mark Zuckerberg and his college roommate started Facebook in 2004, do you think he knew that he would someday be holding personal information of 2 billion users hostage in the palm of his hand, and sitting in front of Congress to answer for it? If his written testimony is to be believed, Zuckerberg is truly mystified that such a thing could get out of hand. Yes, today is the day Facebook CEO Mark “Crocodile Tears” Zuckerberg is slated to appear in front of Congress, providing testimony for the Senate Commerce and Judiciary committees, followed by a quick charge of his humanoid flesh-body. He’ll have to testify to a House Energy and Commerce Committee tomorrow. He’s expected to address the Cambridge Analytica scandal, Russia’s meddling in the 2016 election, and a number of Facebook’s other missteps that have piled up at a dizzying pace in the past few weeks. Zuck did his homework. In a document typed in 12-point Times New Roman, he made apology after admission, elaborating on how Facebook’s failures have led to countless breaches of trust, election interferences, data abuses, and so on. It was my mistake, and I’m sorry. I started Facebook, I run it, and I’m responsible for what happens here. He then laid out Facebook’s next steps — painted with a very broad brush — to safeguard private information, and prevent data abuses from happening. If you were expecting Zuckerberg’s statement to be revelatory, well, you’d be disappointed. Nothing in there is surprising. But it does make one thing very clear: Facebook has ballooned into a monstrosity. According to this document, Facebook has not taken a single proactive step to protect the personal information of billions of people — it’s all been in reaction to user outrage when that trust is violated. If we detect suspicious activity, we’ll do a full forensic audit. And if we find that someone is improperly using data, we’ll ban them and tell everyone affected. Breach after breach, abuse after abuse, Facebook reacted in the same way. Let’s throw a bunch of developers at the problem to plug a hole in the hull of a ship that has become so gigantic there’s no way it can sink. Even a hull that is completely riddled with holes and cracks won’t sink immediately if it’s big enough. And then… then there is the interference in the 2016 presidential election. We were too slow to spot and respond to Russian interference, and we’re working hard to get better… We will continue working with the government to understand the full extent of Russian interference, and we will do our part not only to ensure the integrity of free and fair elections around the world, but also to give everyone a voice and to be a force for good in democracy everywhere. Working hard to get better? What in the heck does “better” mean? We still don’t “understand the full extent of Russian interference,” so now that we’re two years out from the 2016 election, how exactly will this help us? I don’t want anyone to use our tools to undermine democracy. That’s not what we stand for. But don’t worry, Mark has a great plan in place: throw more money and bodies at the problem until investors are satisfied (or just really, really tired of hearing about this, whatever comes first). The company makes about $28 billion in revenue every year. Most users probably wouldn’t mind if that dipped by, I don’t know, a slick billion or so if it meant they could use the platform with greater peace of mind. Lest we be too hasty to jump to criticism, Zuckerberg conveniently reminds us of the good that Facebook has brought into the world, too. He refers to the #metoo movement, the March for Our Lives, and humanitarian relief, all organized and collected with the help of Facebook. But is it enough to offset the dishonesty, or the failure to act proactively, and protect our information from doing evil? Just before his concluding remarks, Zuckerberg admits that it’s just really gosh-darn hard to save a gigantic ship from sinking. Security — including around elections — isn’t a problem you ever fully solve. What will happen if Facebook doesn’t actually fix its many failings? Would it finally go away? Would the world be better off without it? Or would another company step up to take its place? Zuckerberg has been publicly apologizing for nearly 15 years. And his words sound 15 times more hollow now, considering they’ve been — almost word by word — identical. Every. Single. Time. I realize the issues we’re talking about today aren’t just issues for Facebook and our community — they’re challenges for all of us as Americans. That’s easy to say. Facebook made it this way. It made this mess. And now it’s time for Congress to clean it up. Hopefully Congress will hold Zuckerberg accountable, fine them, or even introduce regulation to protect users, comparable to that in the European Union.